Police Say "No Foul Play"
This is Not Isolated. This is Common. 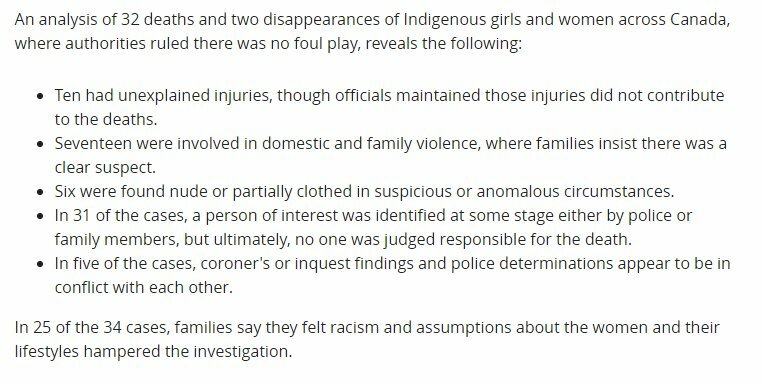 THIS IS ALSO WHY AN INQUIRY INVOLVING THE VERY PEOPLE THAT SEE "NO FOUL PLAY" IS AN ISSUE. Clive Weighill, president of the Canadian Association of Chiefs of Police, acknowledges that some investigations have not been done properly. The body of Patricia Carpenter, 14, was found wedged head-first into a hole on a construction site. Toronto police determined there was no foul play in connection with her death. Tanya Hill, 28 found to have died of acute alcohol poisoning by Ontario coroner. Autopsy revealed signs of trauma. "her reportedly abusive partner came to the Hamilton police station and appeared to be "confessing" to her murder. He was never charged." Regina police admit errors in their investigation of the death of Nadine Machiskinic, 29 and have apologized to her family. Machiskinic fell 10 storeys down a laundry chute at Regina’s Delta Hotel. She was last seen in Yellowknife on Nov. 27, 2010. The Yellowknife RCMP is investigating the missing persons case, but her family wonders why it took a month for officers to conduct an air search. Disappeared from Behchoko, N.W.T., on July 22, 1990. On June 9, 2017, Supreme Court issued order Charlene Presumed dead. family members said they last spoke with police about her around 2008. On Dec. 1, 2007 Chantelle was seen for the last time in Grande Prairie, Alberta. Investigators last contacted Chantelle’s family in 2012. The toddler, who was living in foster care, was in a coma, had massive brain swelling, hypothermia and multiple bruises. She died two days later. In 2007, a coroner’s inquest concluded that Savannah’s death was a homicide, Yet NO CHARGES! I Can Go On and ON and ON and ON! and ON! We Do Show After Show, and Hear the Screams of Mothers and Family Members. There Was a Show where, The Pain was So Deep, All we Could do was Cry. No Words. Just A Mothers Scream and Vincent and I Crying. All I Want is For People to Hear and See and Listen and CARE. I Don't Want to Take anything away From Other People that Go Missing and Are Killed. I Want Indigenous People To Mean Just as Much. I Want People to Stop Dismissing Us When We Grieve. After Reading and Watching this...Ask Yourself, "Is This Someone That Deserves to be Celebrated?" I am ConVINCEd (Get it? hee hee) He is a Superhero. Vincent Became a Leitenant in the Army. Before that, He was a Medac and was Working in the Private Sector as a Phlebotomist. This was in San Francisco and Happened to be at the Exact Time the AIDs Epidemic Started. It was Not Yet Called AIDs. Much to @VinceSchilling Dismay, The People Workin with him Called it "The Gay Disease". Vincent was Not Asigned to what was and Became the AIDs Ward. 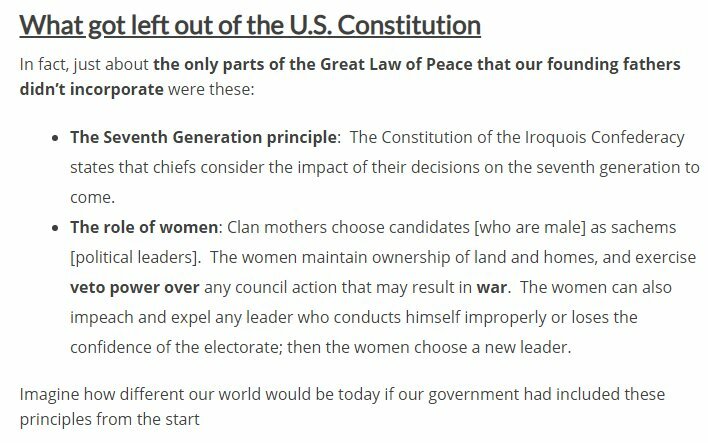 In the 18th Century, the Iroquois League was the oldest, most highly evolved participatory democracy on Earth. You set out why you believe the deal you have negotiated is in the national interest and appeal for the nation to support it. I hope you take the time to read my reply. 2/ The referendum asked whether we should remain or leave the EU. It was essentially a question to each of us: what is best for the UK? 3/ My view was and still is that we should remain the EU. But I get that others think we are better off leaving. The question throughout the Brexit process, at the start, middle and end, has to be: are we making the UK better off? If we are not, then what? 1. Oh boy...we have reached a precipice. A LOT of people are going to question what's going on here. There are people slamming and people praising @POTUS for his decision about #Khashoggi's alleged murder and the Crown Prince Mohammed Bin Salman's involvement. Read on! 2. I say "alleged" because not one shred of evidence has been presented to the media or to the general public, in any country, that Khashoggi was in fact kidnapped, bound, tortured, murdered, dismembered, dissolved, and disposed of. Not one shred of evidence! 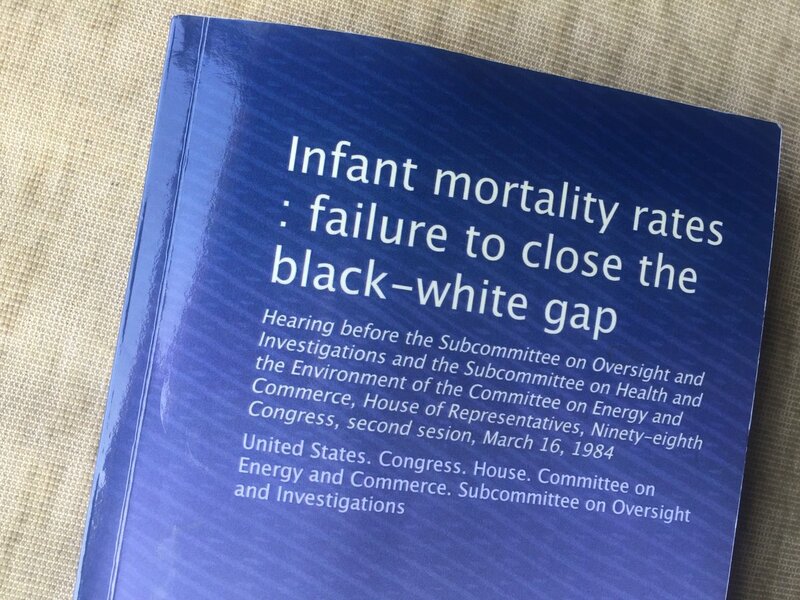 With the amount of..
Black babies in the US are twice as likely to die before their first birthday as white babies. How has this been true for so long? How do we fix it? While I was researching & reporting, this document from 1984 became my best friend. (1) The key threshold question is whether the White House follows up on President Trump’s tweet yesterday promising “officially” to direct the Justice Department to investigate supposed infiltration of the Trump campaign for political purposes. If it doesn’t, the whole episode may peter out—at least for now. That has happened before. It could happen again. Remember that Trump is, among other things, a wuss. THREAD: It was pretty clear in the days after Hurricane Maria that people were getting sick and dying more than usual. I met people whose relatives ran out of oxygen and died, contracted bacteria from rat urine, or couldn't get dialysis. Even when the government said all hospitals were open, General Buchanan, who led U.S. military efforts in Puerto Rico, said to me: "Define open." 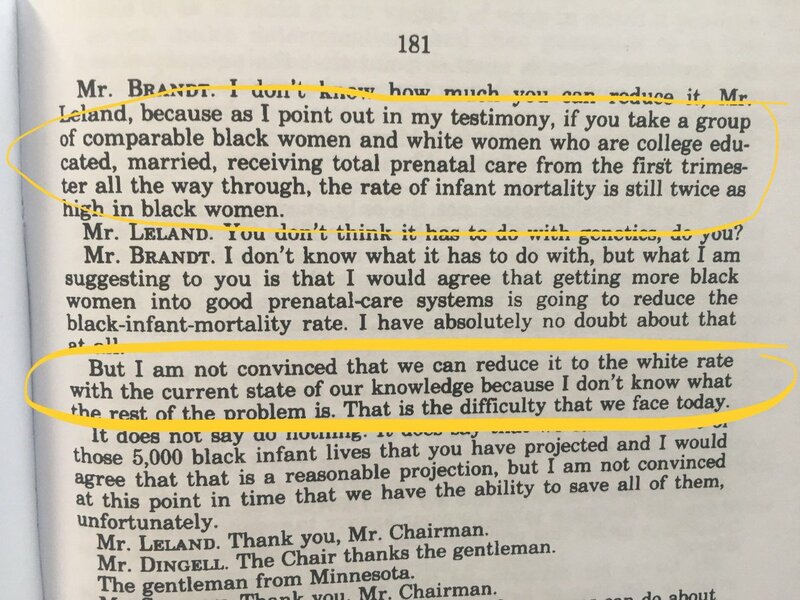 And he was right: I found hospitals that weren't taking new patients or only taking pregnant women. Or that had no air conditioning. Then I attended a press conference in Puerto Rico, where PR government officials insisted that it was basically a coincidence that nearly 500 more people had died of "natural causes" in September 2017 versus 2016.